Shirley Temple Black (April 23, 1928 – February 10, 2014) was an American actress, singer and dancer, most notable as Hollywood's number one box-office star from 1935 to 1938. As an adult, she was named United States ambassador to Ghana and to Czechoslovakia and also served as Chief of Protocol of the United States. 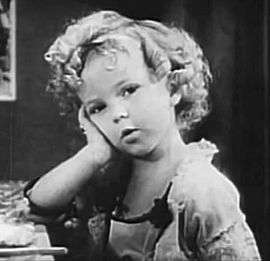 Shirley Temple began her film career in 1932 at age 3. In 1934, she found international fame in Bright Eyes, a feature film designed specifically for her talents. She received a special Juvenile Academy Award in February 1935 for her outstanding contribution as a juvenile performer to motion pictures during 1934, and film hits such as Curly Top and Heidi followed year after year during the mid-to-late 1930s. Licensed merchandise that capitalized on her wholesome image included dolls, dishes, and clothing. Her box-office popularity waned as she reached adolescence. She appeared in a few films of varying quality in her mid-to-late teens, and retired from films in 1950 at the age of 22. Shirley Temple was born on April 23, 1928, in Santa Monica, California. She was the daughter of Gertrude Amelia Temple, a homemaker, and George Francis Temple, a bank employee. The family was of English, German, and Dutch ancestry. She had two brothers, George Francis, Jr., and John Stanley. Her mother supported her young daughter's singing, dancing, and acting talents, and in September 1931, enrolled her in Meglin's Dance School in Los Angeles. About this time, her mother began styling her daughter's hair in ringlets. While at Meglin's, she was spotted by Charles Lamont, a casting director for Educational Pictures. Although Shirley hid behind the piano while in the studio, Lamont took a shine to her, invited her to audition, and in 1932, signed her to a contract. Educational Pictures were about to launch their Baby Burlesks, multiple short films satirizing recent film and political events, using preschool children in every role. Baby Burlesks was a series of one-reelers; another series of two-reelers called Frolics of Youth followed, with Shirley playing Mary Lou Rogers, a youngster in a contemporary suburban family. To underwrite production costs at Educational, she and her child co-stars modeled for breakfast cereals and other products. She was lent to Tower Productions for a small role in her first feature film (The Red-Haired Alibi) in 1932 and, in 1933, to Universal, Paramount, and Warner Bros., for various parts. After Educational Pictures declared bankruptcy in 1933, her father purchased her contract for $25. While walking out of the viewing of her last Frolics of Youth picture, Fox Film songwriter Jay Gorney saw the little girl dancing in the movie theater lobby. Recognizing her from the screen, he arranged for her to have a tryout for the movie Stand Up and Cheer!. Arriving for the audition on December 7, 1933, she won the part and was signed to a $150-per-week contract guaranteed for two weeks by Fox Film Corporation. The role then was a breakthrough performance for her. Her charm was evident to Fox heads, as she was ushered into corporate offices almost immediately after finishing Baby Take a Bow song and dance number she did with James Dunn. On December 21, 1933, her contract was extended to a year at the same $150/week with a seven-year option and her mother Gertrude was hired on at $25/week as her hairdresser and personal coach. Released in May 1934, Stand Up and Cheer! became Shirley's breakthrough film. Within months, she became the symbol of wholesome family entertainment. In June, her success continued with a loan-out to Paramount for Little Miss Marker. After the success of her first three movies, the Temples realized Shirley was not being paid enough. Her image also began to appear on numerous commercial products without approval and without compensation. To get control over the corporate unlicensed use of her image and to negotiate with Fox, the girl's parents hired the lawyer Loyd Wright to represent them. On July 18, 1934, the contractual salary was raised to $1,000 a week and her mother's salary was raised to $250 a week, with an additional $15,000 bonus for each movie finished. Cease and desist letters were sent out to many companies and the process was begun for awarding corporate licenses. On December 28, 1934, Bright Eyes was released. It was the first feature film crafted specifically for the girl's talents and the first where her name appeared over the title. Her signature song, "On the Good Ship Lollipop", was introduced in the film and sold 500,000 sheet-music copies. In February 1935, Shirley Temple became the first child star to be honored with a miniature Juvenile Oscar for her film accomplishments,[note 2] and she added her foot- and handprints to the forecourt at Grauman's Chinese Theatre a month later. Most of the Shirley Temple films were cheaply made at $200,000 or $300,000 per picture and were comedy-dramas with songs and dances added, sentimental and melodramatic situations, and little in the way of production values. Her film titles are a clue to the way she was marketed—Curly Top and Dimples, and her "little" pictures such as The Little Colonel and The Littlest Rebel. Shirley often played a fixer-upper, a precocious Cupid, or the good fairy in these films, reuniting her estranged parents or smoothing out the wrinkles in the romances of young couples. Elements of the traditional fairy tale were woven into her films: wholesome goodness triumphing over meanness and evil, for example, or wealth over poverty, marriage over divorce, or a booming economy over a depressed one. As the girl matured into a pre-adolescent, the formula was altered slightly to encourage her naturalness, naïveté, and tomboyishness to come forth and shine while her infant innocence, which had served her well at six but was inappropriate for her tweens (or later childhood years), was toned down. In the contract they signed in July 1934, Shirley's parents agreed to four films a year (rather than the three they wished). A succession of films followed: The Little Colonel, Our Little Girl, Curly Top (with the signature song "Animal Crackers in My Soup"), and The Littlest Rebel in 1935. Curly Top and The Littlest Rebel were named to Varietys list of top box office draws for 1935. In 1936, Captain January, Poor Little Rich Girl, Dimples,[note 5] and Stowaway were released. Curly Top was Shirley's last film before the merger of 20th Century and Fox. Based on Shirley Temple's many screen successes, Zanuck increased budgets and production values for her films. By the end of 1935, her salary was $2,500 a week. In 1937, John Ford was hired to direct the sepia-toned Wee Willie Winkie (Temple's own favorite) and an A-list cast was signed that included Victor McLaglen, C. Aubrey Smith and Cesar Romero. Elaborate sets were built at the famed Iverson Movie Ranch in Chatsworth, Calif., for the production, with a rock feature at the heavily filmed location ranch eventually being named the Shirley Temple Rock. Shirley Temple and Twentieth Century-Fox sued for libel and won. The settlement remained in trust for the girl in an English bank until she turned twenty-one, when it was donated to charity and used to build a youth center in England. The only other Shirley Temple film released in 1937 was Heidi. Midway through the shooting of the movie, the dream sequence was added into the script. There were reports that the little actress was behind the dream sequence and that she was enthusiastically pushing for it but in her autobiography she vehemently denied it. Her contract gave neither her nor her parents any creative control over the movies she was in. She saw this as the collapse of any serious attempt by the studio to build upon the dramatic role from the previous movie Wee Willie Winkie. Shirley Temple in The Little Princess, her first color film. The Independent Theatre Owners Association paid for an advertisement in the Hollywood Reporter in May 1938 that included Shirley Temple on a list of actors who deserved their salaries while others, such as Katharine Hepburn and Joan Crawford, were described as "whose box-office draw is nil". That year Rebecca of Sunnybrook Farm, Little Miss Broadway and Just Around the Corner were released. The latter two were panned by the critics, and Corner was the first of her films to show a slump in ticket sales. The following year, Zanuck secured the rights to the children's novel, A Little Princess, believing the book would be an ideal vehicle for the girl. He budgeted the film at $1.5 million (twice the amount of Corner) and chose it to be her first Technicolor feature. The Little Princess was a 1939 critical and commercial success with Shirley's acting at its peak. Convinced that the girl would successfully move from child star to teenage actress, Zanuck declined a substantial offer from MGM to star her as Dorothy in The Wizard of Oz and cast her instead in Susannah of the Mounties, her last money-maker for Twentieth Century-Fox. The film was successful, but because she made only two films in 1939 instead of three or four, Shirley dropped from number one box-office favorite in 1938 to number five in 1939. In 1939, she was the subject of the Salvador Dalí painting Shirley Temple, The Youngest, Most Sacred Monster of the Cinema in Her Time and she was animated and was with Donald Duck in The Autograph Hound. In 1940 Lester Cowan, an independent film producer, bought F. Scott Fitzgerald's short story, "Babylon Revisited and Other Stories" for $80 which was a bargain. Fitzgerald thought his screenwriting days were over and with some hesitation accepted Cowan's offer to write the screenplay, titled "Cosmopolitan," based on the short story. 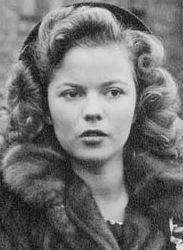 After finishing the screenplay, Scott was told by Cowan that he would not do the film unless Shirley Temple starred in the lead of the youngster Honoria. Fitzgerald objected, saying that at age 12, going on twenty, the actress was too worldly for the part and would detract from the aura of innocence otherwise framed by Honoria's character. After meeting Shirley in July, Fitzgerald changed his mind and tried to persuade her mother to let her star in the film. However, her mother demurred. In any case, the Cowan project was shelved by the producer. F. Scott Fitzgerald was later credited for the use of the original story for The Last Time I Saw Paris, starring Elizabeth Taylor. In 1940, Shirley starred in two flops at Twentieth Century-Fox, The Blue Bird and Young People. Her parents bought up the remainder of her contract and sent her at the age of 12 to Westlake School for Girls, an exclusive country day school in Los Angeles. At the studio, the girl's bungalow was renovated, all traces of her tenure expunged, and the building reassigned as an office. The actress had her own radio series on CBS. Junior Miss debuted March 4, 1942, with her in the title role. The series was based on stories by Sally Benson. Sponsored by Procter & Gamble, Junior Miss was directed by Gordon Hughes, with David Rose as musical director. After her departure from Twentieth Century-Fox,[note 6] MGM signed Shirley for her comeback, and made plans to team her with Judy Garland and Mickey Rooney for the Andy Hardy series. The idea was quickly abandoned, with MGM teaming her with Garland and Rooney for the musical Babes on Broadway. Fearing that either of the latter two could easily upstage the girl, MGM replaced her with Virginia Weidler. As a result, her only film for Metro became Kathleen in 1941, a story about an unhappy teenager. The film was not a success and her MGM contract was canceled after mutual consent. Miss Annie Rooney followed for United Artists in 1942, but was unsuccessful. [note 7] The actress retired for almost two years from films, focusing on school and activities. In 1944, David O. Selznick signed Shirley Temple to a four-year contract. She appeared in two wartime hits: Since You Went Away and I'll Be Seeing You. Selznick however became involved with Jennifer Jones and lost interest in developing Shirley's career. She was lent to other studios with Kiss and Tell, The Bachelor and the Bobby-Soxer,[note 8] and Fort Apache being her few good films at the time. According to biographer Robert Windeler, her 1947–49 films neither made nor lost money, but "had a cheapie B look about them and indifferent performances from her". Selznick suggested she move abroad, gain maturity as an actress, and even change her name. She was typecast, he warned her, and her career was in perilous straits. After auditioning for and losing the role of Peter Pan on the Broadway stage in August 1950, Temple took stock, admitted her recent movies had been poor fare, and announced her retirement from films on December 16, 1950. At the height of her popularity, Shirley Temple was often the subject of myths and rumors, some propagated by 20th Century Fox/Fox Films. Fox also publicized her as a natural talent with no formal acting or dance training. As a way of explaining how she knew stylized buck and weave dancing, she was enrolled in the Elisa Ryan School of Dancing for two weeks. One persistent rumor that was especially prevalent in Europe was that Shirley was not a child but a 30-year-old dwarf due in part to her stocky body type. So prevalent were these rumors that the Vatican dispatched Father Silvio Massante to investigate if she were indeed a child. The fact that she never seemed to miss any teeth led some people to conclude she had all her adult teeth. The girl was actually losing her teeth regularly through her days with 20th Century Fox, most notably during the sidewalk ceremony in front of Grauman's Theatre, where she took off her shoes and placed her bare feet in the cement to take attention away from her face. When acting, she wore dental plates and caps to hide the gaps in her teeth. Another rumor pertaining to her teeth was the idea that they were filed to make them appear like baby teeth. Her biggest trademark, her hair, also was subject of rumors. One rumor that circulated was she wore a wig. More than once, fans yanked her hair to test the theory. She later said she wished all she had to do was wear a wig. The nightly process she went through in the setting of her curls was tedious and grueling, with once a week vinegar rinses burning her eyes. Rumors also spread about her hair color, namely that she wasn't a natural blonde. During the making of Rebecca of Sunnybrook Farm, news spread that she was going to do extended scenes without her trademark curls. During production, she also caught a cold which caused her to miss a couple days. As a result, a false report originated in Britain that all of her hair was cut off. In 1943, 15-year-old Shirley Temple met John Agar (1921–2002), an Army Air Corps sergeant, physical training instructor, and member of a Chicago meat-packing family. On September 19, 1945, when Temple was 17, they married before five hundred guests in an Episcopal ceremony at Wilshire Methodist Church in Los Angeles. On January 30, 1948, the young wife bore a daughter, Linda Susan. Agar became an actor, and the couple made two films together: Fort Apache (1948, RKO) and Adventure in Baltimore (1949, RKO). The marriage became troubled; and Temple divorced Agar on December 5, 1949. She was awarded custody of their daughter. The divorce was finalized on December 5, 1950. In January 1950, Temple met Charles Alden Black, a World War II United States Navy intelligence officer and Silver Star recipient who was Assistant to the President of the Hawaiian Pineapple Company. Conservative and patrician, he was the son of James Black, president and later chairman of Pacific Gas and Electric, and reputedly one of the richest young men in California. Temple and Black were married in his parents' Del Monte, California, home on December 16, 1950, before a small assembly of family and friends. The family moved to Washington DC, when Black was recalled to the Navy at the outbreak of the Korean War. Temple had their son, Charles Alden Black, Jr., in Washington, D.C., on April 28, 1952. Following the war's end and Black's discharge from the Navy, the family returned to California in May 1953. Black managed television station KABC-TV in Los Angeles, and Temple became a homemaker. Their daughter Lori was born on April 9, 1954; Lori went on to be a bassist in the multi-genre band the Melvins. In September 1954, Charles Sr. became director of business operations for the Stanford Research Institute, and the family moved to Atherton, California. The couple were married for 54 years until his death on August 4, 2005, at home in Woodside, California of complications from a bone marrow disease. Between January and December 1958, Temple hosted and narrated a successful NBC television anthology series of fairy-tale adaptations called Shirley Temple's Storybook. She acted in three of the sixteen hour-long episodes, and her son made his acting debut in the Christmas episode, "Mother Goose". The series was popular but faced issues. The show lacked the special effects necessary for fairy tale dramatizations, sets were amateurish, and episodes were telecast in no regular time-slot, making it hard for another. The show was reworked and released in color in September 1960 in a regular time-slot as The Shirley Temple Show. It faced stiff competition from Maverick, Lassie, Dennis the Menace, the 1960 telecast of The Wizard of Oz, and the Walt Disney anthology television series however, and was canceled at season's end in September 1961. Temple continued to work on television, making guest appearances on The Red Skelton Show, Sing Along with Mitch, and other shows. In January 1965, she portrayed a social worker in a pilot called Go Fight City Hall that was never released. In 1999, she hosted the AFI's 100 Years... 100 Stars awards show on CBS, and, in 2001, served as a consultant on an ABC-TV production of her autobiography, Child Star: The Shirley Temple Story. Motivated by the popularity of Storybook and television broadcasts of Temple's films, the Ideal Toy Company released a new version of the Shirley Temple doll and Random House published three fairy tale anthologies under her name. 300,000 dolls were sold within six months and 225,000 books between October and December 1958. Other merchandise included handbags and hats, coloring books, a toy theater, and a recreation of the Baby, Take a Bow polka-dot dress. After her venture into television, Temple became active in the Republican Party in California. In 1967, she ran unsuccessfully in a special election in California's 11th congressional district to fill the seat left vacant by the death of eight-term Republican J. Arthur Younger from leukemia. She ran as a conservative and lost to law school professor Pete McCloskey. Temple was extensively involved with the Commonwealth Club of California, a public-affairs forum headquartered in San Francisco. She spoke at many meetings through the years and was president in 1984. Temple got her start in foreign service after her failed run for Congress in 1967, when Henry Kissinger overheard her talking about Namibia at a party, he was surprised that she knew anything about it. She was appointed delegate to the 24th United Nations General Assembly by President Richard M. Nixon (September – December 1969), and was appointed United States Ambassador to Ghana (December 6, 1974 – July 13, 1976) by President Gerald R. Ford. She was appointed first female Chief of Protocol of the United States (July 1, 1976 – January 21, 1977), and was in charge of arrangements for President Jimmy Carter's inauguration and inaugural ball. She served as the United States Ambassador to Czechoslovakia (August 23, 1989 – July 12, 1992), having been appointed by President George H. W. Bush. 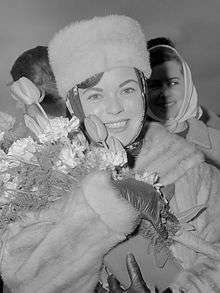 She was the first and only female US ambassador to Czechoslovakia. Temple was a witness to two crucial moments in the history of Czechoslovakia's fight against Communism. She was in Prague in August 1968, as a representative of the International Federation of Multiple Sclerosis Societies and was going to meet with Czechoslovakian party leader Alexander Dubček on the very day that Soviet-backed forces invaded the country. Dubček fell out of favor with the Soviets after a series of reforms known as the Prague Spring. Temple, who was stranded at a hotel as the tanks rolled in, sought refuge on the roof of the hotel. She later reported that it was from here she saw an unarmed woman on the street gunned down by Soviet forces, a sight that stayed with her for the rest of her life. Later, after she became ambassador to Czechoslovakia, she was present in the Velvet Revolution, which brought about the end of Communism in Czechoslovakia. Temple played a critical role in hastening the end of the Communist regime by openly sympathizing with anti-Communist dissidents and later establishing formal diplomatic relations with the newly elected government led by Václav Havel. She took the unusual step of personally accompanying Havel on his first official visit to Washington, riding along on the same plane. In 1972, at age 44, Temple was diagnosed with breast cancer. The tumor was removed and a modified radical mastectomy performed. She announced the results of the operation on radio and television and in a February 1973 article for the magazine McCall's. In doing so, she became one of the first prominent women to speak openly about breast cancer. Temple served on boards of directors of large enterprises and organizations such as The Walt Disney Company, Del Monte Foods, Bank of America, the Bank of California, BANCAL Tri-State, Fireman's Fund Insurance, the United States Commission for UNESCO, the United Nations Association and the National Wildlife Federation. Shirley Temple died on February 10, 2014, at age 85. She was at her home in Woodside, California. Her family stated only that she died of natural causes. The specific cause, according to her death certificate released on March 3, 2014, was chronic obstructive pulmonary disease. A lifelong smoker, she avoided revealing her habit in public to avoid setting a bad example for her fans. 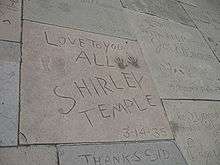 On March 14, 1935, Shirley left her footprints and handprints in the wet cement at the forecourt of Grauman's Chinese Theatre in Hollywood. She was the Grand Marshal of the New Year's Day Rose Parade in Pasadena, California three times in 1939, 1989, and 1999. On February 8, 1960, she received a star on the Hollywood Walk of Fame. In February 1980, Temple was honored by the Freedoms Foundation of Valley Forge, Pennsylvania, along with U.S. Senator Jake Garn of Utah, actor James Stewart, singer John Denver, and Tom Abraham, a businessman from Canadian, Texas, who worked with immigrants seeking to become U.S. citizens. ↑ In keeping with her star status, Winfield Sheehan, built the girl a four-room bungalow at the studio with a garden, a picket fence, a tree with a swing, and a rabbit pen. The living room wall was painted with a mural depicting her as a fairy-tale princess wearing a golden star on her head. Under Zanuck, she was assigned a bodyguard, John Griffith, a childhood friend of Zanuck's (Edwards 77), and, at the end of 1935, Frances "Klammie" Klampt became her tutor at the studio (Edwards 78). 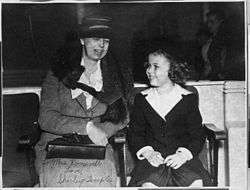 ↑ Shirley and her parents traveled to Washington, DC, late in 1935 to meet Roosevelt and his wife Eleanor. The presidential couple invited the Temple family to a cook-out at their home, where Eleanor, bending over an outdoor grill, was hit smartly in the rear with a pebble from the slingshot that Shirley carried everywhere in her little lace purse (Edwards 81). ↑ In Dimples, Shirley was upstaged for the first time in her film career by Frank Morgan who played Professor Appleby with such zest as to render the child actress almost the amateur (Windeler 175). ↑ the teenager received her first on-screen kiss in the film (from Dickie Moore, on the cheek) (Edwards 136). ↑ Temple took her first on-screen drink (and spat it out) in Bobby-Soxer. The Women's Christian Temperance Union protested that unthinking teenagers might do the same after seeing the teenage Shirley in the film (Life Staff 140). ↑ "Shirley Temple". biography.com. Retrieved August 15, 2012. ↑ Child Star. McGraw-Hill. 1998. ISBN 978-0-07-005532-2. ↑ "Box-office Busts/Boys and Girls". Life. pp. 13, 28. Retrieved September 8, 2012. ↑ "Shirley Temple in Title Role Of 'Junior Miss' Radio Drama". Harrisburg Telegraph. February 28, 1942. p. 22. Retrieved March 28, 2015 – via Newspapers.com. ↑ Black, Shirley Temple (1988). Child Star: An Autobiography. New York: McGraw-Hill. pp. 39–41. ISBN 978-0-07-005532-2. ↑ Black, Shirley Temple (1988). Child Star: An Autobiography. New York: McGraw-Hill. pp. 72–73, 183–184. ISBN 978-0-07-005532-2. 1 2 Lindeman, Edith. "The Real Miss Temple". Richmond Times-Dispatch. Retrieved 15 May 2014. ↑ Black, Shirley Temple (1988). Child Star: An Autobiography. New York: McGraw-Hill. pp. 68–69. ISBN 978-0-07-005532-2. ↑ "Child Star: The Shirley Temple Story (2001)". Rotten Tomatoes. Retrieved August 15, 2012. ↑ Sean Howell (July 1, 2009). "Documentary salutes Pete McCloskey". The Almanac Online. Embarcadero Publishing Co. Retrieved February 12, 2014. ↑ Romney, Lee (June 11, 2012). "Between two public servants, Purple Heart-felt admiration". LATimes.com. The Los Angeles Times. Archived from the original on June 15, 2012. Retrieved February 11, 2014. ↑ "In Memoriam: Shirley Temple Black". Retrieved November 13, 2014. ↑ Joshua Keating, "Shirley Temple Black's Unlikely Diplomatic Career," Slate, 11 Feb 2014 <http://www.slate.com/blogs/the_world_/2014/02/11/shirley_temple_black_s_unlikely_diplomatic_career.html>. ↑ Craig R. Whitney, "Prague Journal: Shirley Temple Black Unpacks a Bag of Memories," New York Times, 11 Sep 1989 <http://www.nytimes.com/1989/09/11/world/prague-journal-shirley-temple-black-unpacks-a-bag-of-memories.html>. ↑ Joshua Keating, "Shirley Temple Black's Unlikely Diplomatic Career: Including an Encounter with Frank Zappa," Slate, 11 Feb 2014 <http://www.slate.com/blogs/the_world_/2014/02/11/shirley_temple_black_s_unlikely_diplomatic_career.html>. ↑ Thornton, Michael (April 18, 2008). "Shirley Temple: the superstar who had her childhood destroyed by Hollywood". Daily mail. Retrieved August 15, 2012. ↑ "Hollywood star Shirley Temple dies". BBC News. 11 February 2014. Retrieved February 11, 2014. ↑ "Shirley Temple, former Hollywood child star, dies at 85". Reuters. Retrieved February 11, 2014. ↑ "EXCLUSIVE: Shirley Temple revealed to be a secret smoker and actually died from lung disease ... but her family covered it up to protect her 'goody goody' image". Daily Mail. Retrieved March 3, 2014. ↑ "Obituary: Shirley Temple". BBC News. 11 February 2014. Retrieved 24 December 2014. ↑ "Shirley Temple Black". The National Board of Review. Archived from the original on 2011-07-27. Retrieved February 12, 2014. ↑ "History of Past Honorees". The John F. Kennedy Center for the Performing Arts. Retrieved February 12, 2014. ↑ "Shirley Temple Black: 2005 Life Achievement Recipient". Screen Actors Guild. Archived from the original on 2008-09-07. Retrieved February 12, 2014. ↑ "The Shirley Temple Monument". Nijart. Retrieved February 12, 2014. Balio, Tino (1995) . Grand Design: Hollywood as a Modern Business Enterprise, 1930–1939. University of California Press. ISBN 0-520-20334-8. Barrios, Richard (1995). A Song in the Dark: The Birth of the Musical Film. Oxford University Press. ISBN 0-19-508810-7. Black, Shirley Temple (1989) . Child Star: An Autobiography. Warner Books, Inc. ISBN 0-446-35792-8. Burdick, Loraine (2003). The Shirley Temple Scrapbook. Jonathan David Publishers, Inc. ISBN 0-8246-0449-0. Edwards, Anne (1988). Shirley Temple: American Princess. William Morrow and Company, Inc. ISBN 0-688-06051-X. Windeler, Robert (1992) . The Films of Shirley Temple. Carol Publishing Group. ISBN 0-8065-0725-X. Dye, David (1988). Child and Youth Actors: Filmography of Their Entire Careers, 1914-1985. Jefferson, NC: McFarland & Co., pp. 227–228.